ROAD TOWN, Tortola, VI – “I personally believe that the legislation that is currently on our books needs to be addressed, said Chief Inspector of the Royal Virgin Islands Police Force (RVIPF) Mr Kenrick Headley, blaming such weakness for the traffic woes in the Territory. He made the comment yesterday January 28, 2014 during a press conference where he was among other senior officers of the RVIPF. At that press conference, he expressed that view that the rules of traffic are being ignored to the greater extent because of the many weak areas of the obsolete legislation. To illustrate his point, he said that example if the meagre amount of $50 fine for riding without a helmet. “It’s not only about motorcycles. It’s about our law, the abuse to our traffic legislation. It’s about [wearing the seat belt]. It’s about the cellular phone usage…” he noted. Commissioner of Police Mr David Morris also alluded to the need for penalties to be more severe. It was also brought out at the press conference that the majority of violators of traffic laws are persons of the 25 years old bracket. ROAD TOWN, Tortola, VI – Royal Virgin Police Force (RVIPF) Chief Inspector Mr Kenrick Headley is not keen on pulling down the red flag on motorcycle accidents occurring in the Virgin Islands (VI) despite figures showing that there has been a decline in the numbers over the past years. Mr Headley made the statement at a press conference held in the conference room of the RVIPF Head Quarters earlier today January 28, 2014 where he was joined by other top officials in the Police Force. 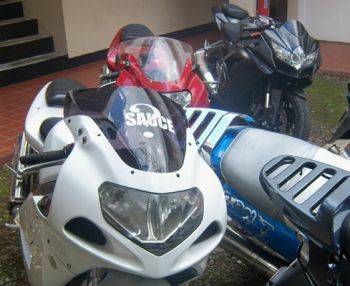 He reported that from the period 2011 to date there was a total of five fatalities involving motorcyclists: 1 in 2011 and 2012 each, 2 in 2013 and one so far in 2014. “We have a concern for the accidents that have occurred recently and on top of that we had just on Sunday two tourists suffered injuries,” he emphasised. Of 1219 traffic collisions for 2013 alone, 37 involved motor cycles, he said. “Now you would see that in the last three years we would have been steadily decreasing the amount of accidents but they are still alarming taking into consideration that we had over 15,000 vehicles registering in the territory,” said Headley. In their bid to put a grip on the current challenges being faced in the traffic division of the RVIPF Mr Headley says that it is their firm belief that if they are to partner with some key stakeholders there can be a reduction in the number of traffic collisions and road fatalities in the territory. The senior RVIPF officer said that the concerns about the use of motorcycles have not evaded the department’s ears to the extent that with the assistance of public spirited persons, some 13 illegal motorcycles were confiscated by the department. “..Those were motorcycles above the 500 cc and that is a lot to me, why? Because these motorcycles are not permitted on our roads, they are not to be imported, or to be used,” emphasised Mr Headley. He said that in the traffic department alone for 2013, some 517 complaints were placed before the court for traffic violations. Of that figure 328 have already been disposed according to Mr Headley. I am wondering if the stats reflect the accidents on Anegada also.There are scooter accidents involving tourists every week.Some have to be airlifted to Peebles. How can they be on the decline when they just started happening every week or so. It is too early to tell for now. Give this report in 6 months to compare the stats. Okay I'm sleepy right now so may not have read the article clearly but you CANNOT compare the number of motorcycle accidents to car accidents. From the statistics it does not appear that there has been a decrease. Correct me if I'm wrong but plain and simple his information is erroneous. How can you come to that conclusion when we done bury two for the year and one in wait just 27 days into january???? I mussss be living on Mars!!!!! its because you dumb fools do not read and understand, all you just run all you mouth like a trumpet, i know bvislanders are donse people but a few have a bit of sense, read and understand, january just started moomoo, those starts was for 2011, 2012 and 2013, cheeeeeeeeeeze. read read read read and understand moomoo. Since you got so much sense and ain no dunce, do you know what probability??? Go and research to connection between this story and probability, fool. What does probability has to do with a report based on statistical data? meant to outline the occurrence of accidents?? in the past??? stop pulling word out the dictionary! Well jack ah say dd you an a$$ and a half!! The statistics are for the last few years. It would be idiotic of the officer to refer to January only and say there has been a decreases. It would obviously be too early to draw that conclusion. They are the same ones who said we did not have a problem when they were breaking every home in the BVI looking for gold to sell to the cash for gold people. I see a pattern here with the RVIPF they don't know what they are doing. The English language is a funny thing..can you people read....it's says one fatality so far in 2014....mr. Chapman was in 2013. Well, let's see: we had 37 accidents in 2013. Two resulted in fatalities or about a 5.4 percent mortality rate. On the other hand, we had about 1,200 vehicle accidents reported and no fatalities in that year. This year, two motorcycle accident, one fatality and two folks seriously injured. I don't think this is a sound basis by which to say that motorcycle accidents are on the decrease. Moreover, how many motorcycle accidents, particularly those that involve one vehicle only are unreported? First of all, there was at least one vehicle fatality in 2013 so don't pull facts out of nowhere. Secondly, I'm sure that there were more than 1200 accidents. Almost every weekend there is a single car crash that the cops never hear about. The car usually gets towed away before the sun comes up. Not sure what you mean about pulling facts from nowhere. I was citing recently reported information. But, since your memory appears to be better than mine, based on recently reported estimates of about 1,200 accidents in the last year, and one fatality, the mortality rate for vehicle accidents is 0.083 percent. As estimated above, the mortality rate for motorcycle accidents is about 5.4 percent, or 65 times greater than for cars. And, yes, of course there are many accidents that are not reported, but one can only work with what is reported. My own opinion is that driving in the BVIs is out of control. If it was up to me, radar guns with fines starting at $ 500, a points system (3 points per speeding ticket or reckless driving, 6 points in a rolling 12 month period equals a 6 month suspension), DUI laws with the same penalties as in the US, etc. Everyone forgets that driving is a privilege not a right, but hereabouts, there just aren't any consequences for failing to comply with the laws that we all have to pass a written test on (other than killing or maiming someone else). Enough of this madness! Thank you. I swear these people did not finish school. All they are seeing is fatal accidents. He did not say fatal accidents are on the decline, he said "accidents" are on the decline. There can be 1000 accidents and nobody dies, then have 10 accidents and two people die. That's all the dude is saying. Like Drayton said, maybe these guys have a death wish. If someone decides not to wear their seat belt while speeding and die in an accident, I don't see how that becomes grounds to ban cars. That is basically what these morons are asking for in relations to Scooters. They don't wear helmets? Ok, let's ban them. They need to be taken off the road! The logic makes no sense. All they will do is find something else to kill themselves on. Of course, if you're dumb enough to ride a bike without a helmet, then that ratio will increase, because you are more likely to get dead. Same as with grandstanding, jumping red lights and generally being a d**k on the road. Thank you @Respect people should read and comprehend before commenting. 2014 stats cannot be accounted for, as the year has not been completed. The figures also reflected what was reported, not what occurred , as I would assume that all accidents are not reported. My personal observation is that three of the four fatalities involving scooters were actually accidents that happen because the scooter rider were just riding recklessly and cause their own death, no body hit them, they cashed into objects, one into a vehicle that was stopped. They died as a result of their own negligence . Nobody get charge for their death so nobody cause their death but themselves. Thank you for your explanation. At least one person did not fall asleep in the classroom. The C.I. did say and I quote " one fatality in 2014 so far". The year is relatively new. He cannot predicts what will/ will not happen in the remaining 11 months. Reading and understanding makes a HELL of a difference. Some people don't get it. If you are constantly blogging....take time to correct the foolishness that you write. People all over the globe read your blogs that don't make sense. No Law every prevented a crime yet! Laws are reactionary not proactive methods. The rvipf is just like the ndp blame someone or something for their own incompitence!!! ..and their terrible spelling, grammar and punctuation! I know, let's hang the Teachers! Then later we can go get those Doctors who keep letting people die of old age! Excuses, excuses, excuses!! Blame it on someone/something else! Does anyone in the BVI government EVER take responsibility? It is just plain stupidity. All we law abiders suffer (speed bumps), while law breakers are tried to be prevented. Catch em, fine em, and big time. Soon they stop: speeding, Dark windows (government cars included), parking wrong, no helmets, no lights, no license, no registration, red light offenses, stopping for riders etc. Why bother with ANY laws if none enforced? He is right. The traffic laws need updating. Look how in the BVI people don't indicate. Look how people just stop and hitch rides where ever they want on a two-lane highway. This is something you NEVER do in any other country of the world but here people so arrogant they decide to just stop and the passengers get in and out real slow. Change the laws AND enforce them. And don't study all the paid political fools who just blame everything on NDP or that 'white' police dude. So busy blaming they don't take any notice of the story itself.